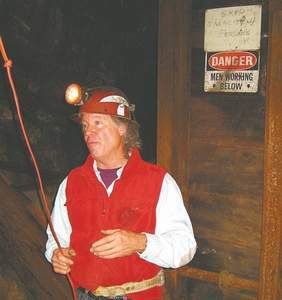 ALLEGHANY — Mike Miller guided a tour group through the thick sludge at the bottom of his 113-year-old mine, the beams of his headlamp glinting off snowy quartz walls of a chilly mine shaft. Thirty-five years into his rocky career as a gold miner at the Original Sixteen to One Mine, he's still part cynic, part starry-eyed dreamer. But he also speaks with a 49er's lusty hopes for precious metal. Battered by up-and-down profits and a lengthy legal battle after an accident killed a miner nearly a decade ago, Miller is clinging to hope that new technology will lead him straight to the mother lode — at a near-record $1,059 for at market close Thursday for every sparkling ounce. Miller's pet project is raising a quarter of a million dollars to do research and development in the mine. His crews unearthed some of their greatest gold nuggets when they first started metal detecting in 1993. But it's been 10 years since his company has sunk serious cash into the high-tech trappings of modern mining. Since then, mine-mapping software has improved, and scientists are using radar and radio wave imaging to locate gold. As he has in the past, Miller also wants to invite scientists to use the mine as a beta site to test new gold detection technologies. The mine's best asset, Miller said, is that it's still operating and well-maintained. The Sixteen to One is North America's oldest continuously operating mine. Gold was first discovered in the tiny town of Alleghany in 1896, and the company was incorporated in 1911. It's famous for dense pockets of gold — like the one mined in 1993 that yielded more than a million dollars' worth in a single day. The dense pockets also turn up nuggets like The Whopper, which weighs 14 pounds and contains 140 troy ounces of gold. Then there are the bare years. In 2007, the mine yielded 50 ounces of gold. Since then, Original Sixteen to One has been in “maintenance mode.” Investors that he hoped would see potential in the mine pulled out when the financial crisis hit last year. “There's a great aversion to risk right now,” Miller said. To keep operations going amid shaky financial times, the company is slowly selling its valuable inventory of gold nuggets.The Whopper is on sale for $850,000. And this summer, Miller put another mine — Brown Bear Mine in Trinity County — up for sale. Before the financial crisis descended, the mine faced a different tragic setback that has lingered for years. On Nov. 6, 2000, miner Mark Fussell was driving a locomotive in the mine shaft and hit his head on a protruding ore chute. Miller then sued the California District Attorneys Association for $24 million in lost opportunity to develop capital, charging that the CDAA lawyers who prosecuted him in the wrongful death case were contracted illegally. He lost in 2007. The financial effects of the suit still linger — including among investors. While Miller is optimistic about the rising price of gold, others are downright ecstatic. Jason Hommel owns J.H. Mint, a new Grass Valley company developing infrastructure to mint silver coins. He also writes a newsletter for 80,000 subscribers and runs a Web site called Silver Stock Reports. Silver's great, but gold is on this market watcher's mind. “We're at the beginning of a very long bull market in gold,” said Hommel, who predicts gold could reach $4,000 an ounce within the next decade. One reason is that China has expressed interest in diversifying its foreign holdings by buying 4,000 metric tons of gold each year, Hommel said. The sheer volume of such purchases would wrest price regulation from the International Monetary Fund, which occasionally moderates price increases by threatening to release 400 metric tons of gold onto the market, Hommel said. Plus, the bond market is suffering, and investors are seeking the security of gold. “A long-term gold price explosion will definitely turn this into a gold mining community again,” Hommel said. Miller agreed gold prices are headed higher, but was more moderate in his expectations. He remains confident about the Sixteen to One's prospects: The mine is in a production mode, not merely exploration mode. But the telephone hasn't been ringing much these days. Miller's first priority is raising the $250,000 he needs to troll the mine with new technology. Then there's the $3.5 million cost to sink a new mine shaft. They've been talking about it since 2003, but so far, the money hasn't come through. In a puffy red vest, jeans and rubber boots, Miller expertly guided the Historical Society members along the muddy mine cart tracks. He's worked here since 1974 and still sees a future in the industry that birthed the Golden State. By some accounts, the mine may appear to be struggling or even face closure. Staff Writer Michelle Rindels can be reached at mrindels@theunion.com or (530) 477-4247.